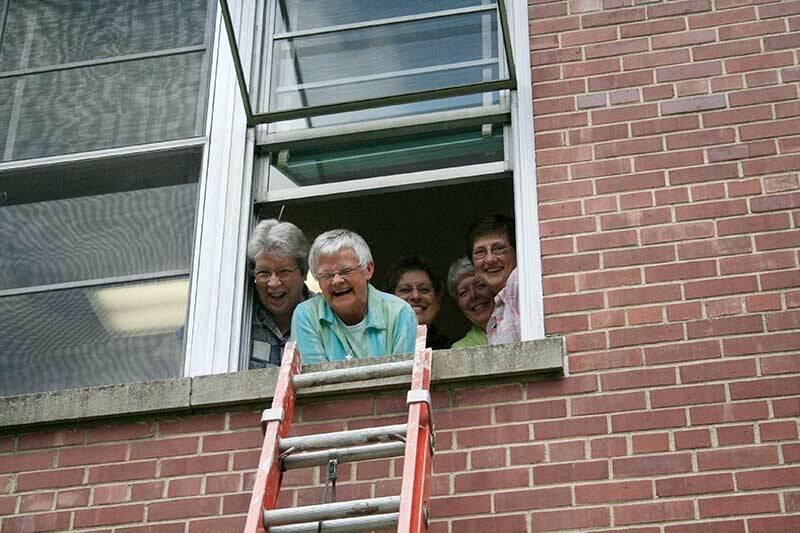 Sister Denise Wilkinson (front) with Sister Nancy Reynolds (back, from left) Sister Paula Damiano, Sister Marsha Speth and Sister Jane Marie Osterholt (RIP) in a photo from 2011 when the General Council got locked in a room inside Owens Hall. For 15 years, Sister Denise Wilkinson has served the Congregation of the Sisters of Providence as vicar/councilor (2001-2006) and as general superior (2006-2016). Sister Denise will complete her second term as general superior with the installation of recently elected officers on Sept. 10. 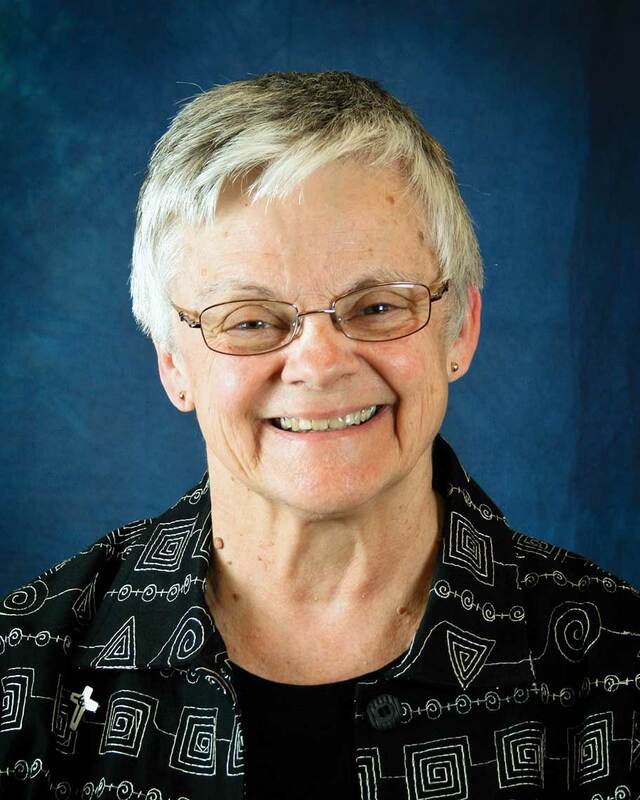 In the 10 years Sister Denise was general superior, many milestones occurred. Sister Denise would be the first to acknowledge the councilors who served with her for all that has been achieved: (first term) Sisters Marsha Speth (vicar/councilor), Jane Marie Osterholt (RIP), Nancy Reynolds, Marie McCarthy and Paula Damiano, and; (second term) Sisters Lisa Stallings (vicar/councilor), Jenny Howard, Mary Beth Klingel and Dawn Tomaszewski. She would also want to recognize the incredible efforts, dedication and fidelity of departments, ministries, programs, staffs, individual sisters and generous benefactors. Land Ethic adopted (2012) and implemented in subsequent years. Achievements, milestones and accomplishments are all wonderful to remember and hold dear, but it is the person of Sister Denise Wilkinson that has endeared her to so many through the years, regardless of her ministry, or place of ministry. To say she will be missed at Saint Mary-of-the-Woods, where she has ministered so many times over so many years, at Saint Mary-of-the-Woods College, and for the Congregation, is an understatement! She has been a wonderful mentor, modeling so well a welcoming presence, graciousness and sensitivity to others that we have come to love about her. She attends to each person and makes each one feel special. Her sense of humor is unique and her one-liners easily catch one off guard. You might figure out what she really said hours later or maybe the next day, if you’re lucky! As Sister Denise ends this portion of her journey, we hope she takes with her the profound gratitude and prayerful support of sisters, Providence Associates, staff, colleagues, all partners in our mission and her many friends. May all the blessings that Providence can bestow find their way to her, wherever she may be, on her much-deserved sabbatical journey next year! Below is a video celebrating Sister Denise! While Denise accomplished so much in her years of Leadership, what struck me the most is the “person” we remember and celebrate so fittingly. The ministry will continue as she would expect it to but she is irreplaceable and that is how we remember her for all the personality, warmth, humor she displays. We are in great hands with our Team going forward as our Community continue to “lean on Providence”. What a beautiful tribute to a very spiritual and loving leader. Thank you, Sr. Denise for saying yes to Providence who led you to lead the Sisters of Providence these past 15 years. Rest, relax and refresh your spirit. When I hear Mother Theodore’s name, immediately two words come to mind: Pioneer, Saint. When I hear Sister Denise’s name, I think of these words: Embassador, Visionist. The qualities of Love, Mercy, and Justice are mere extensions you amplify on a daily basis. What an amazing journey you persued during your leadership years. It has been a blessing for all to share the journey with you. I think Mother Theodore and our Provident God are extremely proud of your many esteemed accomplishments. May you find rest and blessings ahead my friend. I saw you climbing out the window– what a way to begin your next journey! Go, have fun and wherever you are, put on the music and DANCE! Congratulations, Sister Denise! Well-deserved! My favorite memory is still your leadership and guidance over 40 years ago in LeFer as we started our Freshman Year! You were so brave! On behalf of the Class of ’78,thank you for all your years of service to The Sister of Providence and St. Mary-of-the-Woods College! Such a great tribute and well-deserved for Denise. Your accomplishments are many and not only “what” you have done, but most importantly “who” you are will live on in our hearts. Thank you and best wishes! A beautiful tribute for a beautiful woman. Sister Virginia Marie Cashion would be so proud!